​You may be conflicted about the best battery powered leaf blower to purchase, you are not alone. Most people are grappling with the same problem. The truth is that not all leaf blowers work effectively. What is a battery powered leaf blower and who is it for? How does a battery operated leaf blower work? Our top pick for the best battery powered leaf blower is the GreenWorks 24322 Cordless . It is very light and compact for easy handling. It is also very powerful and is suitable for yards, concrete surfaces, rooftops, gutters, driveways, lawns, and gardens. It is also not very expensive considering its high power performance. Due to its multi-functionality, with its vacuum cleaner, you may never need a rake again. ​This blower would have been on top of this list if we were basing it on multi-functionality. It functions both as a blower and a vacuum cleaner, which removes the urgency of other tools, such as rake, basket, and tarp. One of the most powerful blowers in the market. With 340 CFM and 185 MPH, it has enough power to blow even wet leaves. It can mulch and store up to 4.5 bags of leaves per day. Brushless motor increases runtime and adds more power to the blower. Runtime is also quite long from 12 to 40 minutes depending on the level of performance, which is enough to clear out a yard. Lightweight at 3.7 lbs. only. There is a reason why this gadget is referred to as a sweeper- it is because of its ability to keep driveways, patios, garages, and pathways clear of debris, grass cuttings, and dust. It comes with two blower tubes, one for blowing and one for sweeping. The lengths of the tubes are 24 inches long, enough to keep you in an upright posture while working. It is relatively weak in terms of blowing of leaves on lawns and gardens, but when it comes to sweeping concrete surfaces it is an excellent choice. It is also a low noise design, perfect for neighbourhoods with noise restrictions. The gadget is compact and lightweight and can be handheld for a long time without fatigue. Want a blower that will give you value for your money? Look no further than the DEWALT DCBL720P1. With 400 CFM of air volume blown at 90 MPH, all the leaves and debris will find a hard time sticking around on your backyard. It uses the highly efficient brushless motor, which maximizes motor efficiency and motor life and is therefore very durable. At 61dB of noise, this blower is very quiet even at high performance and so you need not worry about hearing complications. It is lightweight for easy handheld portability. For added comfort, it has an ergonomic design that is easy to handle and does not strain the hand. It is part of the 20V Max tools, which means that its 20v battery can be used in other machines within the system, such as hammer drills, grinders, and wrenches. It also comes with a 3-year limited warranty, 1-year full warranty and a 90-day money back guarantee, if you encounter any complications. This blower has the same capacity as gas powered blowers. With up to 465 CFM at 125 MPH, this Worx Turbine is the best bet when it comes to large homesteads with thick heaps of leaves. For more power, it has a Turbo Boost and a variable speed control for various usability. The Turbine blower feature is also another cutting-edge technology that takes air blowing to a whole new level. It features the efficient brushless motor for durability and enhanced performance. The hyper-stream nozzle is tough enough to withstand the high capacity of forceful air volume streaming through it and then projects the air to the leaves and debris with the same force and agility. It also has a cut out for easy hanging. The feature that makes this blower standout is the ability to withstand all weather conditions. So, you don’t have to worry if you forget it in the rain. It has a sleek design, reminiscent of EGO’s great craftsmanship where beauty meets performance. With a high performance of 530 CFM blowing at 110 MPH, this machine is powerful enough to displace all stubborn leaves and debris. The variable speed control feature is for different applicability, while its ergonomic design offers perfect balance and comfort. The turbo boost and brushless motor enhance power and efficiency. Battery powered leaf blowers offer the quickest and fastest ways of keeping our homesteads clean. Finding the right blower for you will depend on your needs. If your only desire is to keep your paved areas clean, then you may opt for a less powerful blower. However, if your goal is to keep your yard nice and clean, then you will need a powerful blower together with a lawn mower for your garden. Battery powered leaf blowers are cordless. That means that you can use them anywhere. 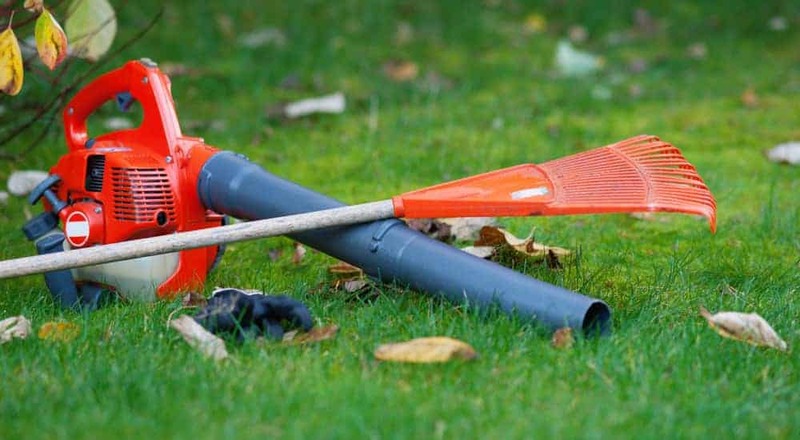 The work of any leaf blower is to simply gather leaves, grass, and debris. The most important thing to ask yourself is what are your needs and what amount of space will you be working with. If your house is located in an area with a lot of debris and leaves, then you need a powerful leaf blower. Also, if you trim hedges of your yard on a regular basis you may need one too as it makes the the tidy up much easier. Using a leaf blower is quite simple. It helps you to gather leaves, grass, and debris into a pile and then the heap is collected into a basket or a tarp using a rake. Although it does the work of a rake, you will still need a rake when it comes to disposal of the garbage heaps. 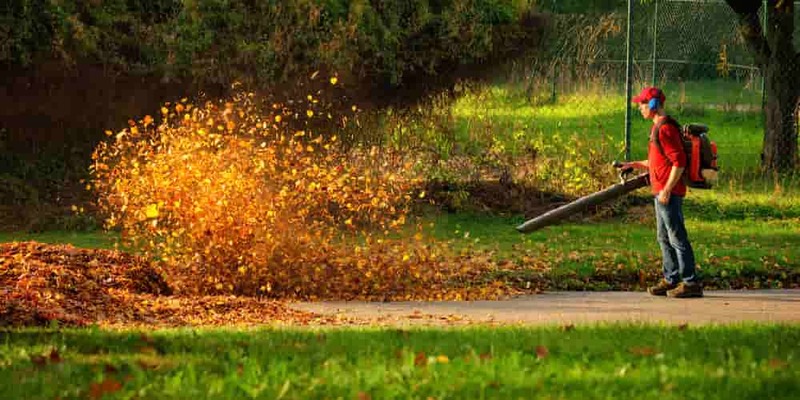 Another advantage of a leaf blower to a rake is that it can blow away tiny debris and dust particles. The air volume is measured in CFM or cubic feet per minute. The higher the air volume the more the power to blow leaves and debris. Air Speed is the speed at which stream of air comes out of the nozzle. It is measured in MPH or miles per hour. This, however, is a poor measure of effectiveness, because with a small nozzle air comes out with higher speed, but the performance may not be adequate. That is the trick that some manufacturers use. They supply a tiny nozzle and indicate a very high speed. A blower with a lower airspeed and a higher air volume will likely outperform a blower with higher airspeed and lower air volume. The most important thing is that the blower should have higher CFM and MPH. It should be strong and able to last long enough to complete the task at hand. Most batteries last between 10 to 30 minutes, so make sure the battery is on the upper end in terms of run-time. You should also look at the charging time for the battery. Most charging sessions last between 30 minutes and 2 hours. A good battery will, therefore, have less charging time and more battery life. Battery life is measured by Ah or Ampere hours. Another battery measurement is V for Voltage. Higher voltage batteries are better because they can drive powerful motors. You may also consider the price of the battery. Avoid blowers with expensive batteries, replacements may eat a large chunk of your money. Furthermore, most batteries are usually not interchangeable between different manufacturers. Ni-Cad batteries are cheaper, but they are also heavier. Another disadvantage is that Ni-Cad batteries’ performance drops, as their power decreases. Lithium-Ion batteries, they are lighter, can be recharged at a faster rate and offer consistent performance throughout their battery life. Lithium battery leaf blowers are therefore better. They may be listed as handheld and portable, but not all of them are lightweight, especially if you handle them for long. Make sure the weight is comfortable for you on one hand because you will always have to spare one hand for the applications. Unfortunately, as the weight decreases so does the power, owing to decrease in size of motor and battery. Gas powered leaf blowers are a bit more powerful than cordless blowers. However, gas-powered blowers are very bulky and all are in the form of backpacks. They also release emissions that may be hazardous to your health and environment. On the hand, corded blowers are inhibited by the length of their cords so they depend on the length of the cord and this will limit your movements significantly. Outdoor cleaning is therefore impractical for corded blowers. Battery powered blowers are the most viable choice. They are lightweight and can easily be carried to whichever area that needs cleaning, in the lawn, garages, rooftops, gutters, sidewalks etc. Cordless electric leaf blowers offer excellent maneuverability. You can use them anywhere, on the lawns, decks, gutters, roofs, driveways etc. They emit less noise compared to gas powered blowers and are eco-friendlier. They are also portable due to their lightweight design and also compact for easier handling and storage. They require low maintenance, just occasional cleaning, and maintenance of the battery. The only safety precaution you should be worry of is noise. Compared to gas powered blowers, battery-powered blowers are less noisy, but they still generate noise that can affect your general hearing. Sound intensity is measured in decibel (dB). Normal conversation is at around 60 dB, while some electric blowers are above 80 dB. This is quite high because in such a noise you have to raise your voice to be heard. It is therefore recommended to use earplugs/muffs when operating a leaf blower. Goggles and dust masks are also a requirement when blowing dust and debris. You should also check out Consumer Product Safety Commission Website to be abreast with all the latest information on any product before purchasing it to be on the safe side. Recently, Ryobi recalled all its 8 amp Electric Jet Fan Blowers. Fan blade pieces were being ejected on either end of the blower, resulting in 10,681 incidents. You should look out for cracks on your blower. Cracks on the housing will expose your fingers to moving parts that may lead to severe injuries. In 2016, a recall was made on some Black + Decker electric leaf blowers, because they had cracks on their casings. Battery powered leaf blowers require very little maintenance. You are only required to clean the outside of the blower preferably with a brush. The blower and the air intake should also be kept clean. Using solvents, such as water is a no-no because most of these blowers are not moisture resistant. You should also not leave it in the rain, for the obvious reason of getting wet. Overcharging and undercharging should be avoided. If you plan to store it for a long time, then you should charge fully the battery and then remove it from the unit. Storage should be under moderate temperatures. Q: What are the most powerful cordless leaf blower extras for? A: Extras are separate features that can are added to the blowers for improved functioning. They differ among different models and should not be the deciding factor when selecting the right cordless leaf blower for you. This is the reason we chose not to include them in the buying guide. For instance, some models have turbo button for faster emission of large bursts of air. Others come with a series of exchangeable nozzles for different applications, while others come with vacuum bags. Q: Is the best portable leaf blower effective on wet leaves? A: Strong blowers are effective on leaves that are moderately wet, but they have to be on high performance mode. Extremely damp leaves are more stubborn for even powerful blowers, because they tend to clump together forming a dense mass. In such a case, you will be better off with a rake than a leaf blower. Remember to mow your lawn frequently to avoid the accumulation of water and therefore reduce the risk damp leaves on the grass. A: Yes, they do. They are best suited for small and medium-duty cleaning jobs such as light leaf cleaning, garage sweeping or clearing a dryer duct. They are easier to handle and maneuver than gas powered ones. If you need to use it for larger yard works, just get one or two batteries to give you a continuous cleaning session without interruption. A: Gas-powered leaf blowers are more powerful than electric ones, on the other hand, electric leaf blowers cost and weigh less than gas-powered ones. Although some electric leaf blowers operate on battery, most need to be connected to an electric outlet before they can function. These kinds of electric leaf blowers need extra extension cords so you can reach farther places on your yard. This could be a difficulty because it limits your flexibility and maneuverability while cutting. However, Electric leaf blowers are environmentally friendly because they don’t emit gases and make less noise when compared with gas-powered ones. A: The simplest ways to store a leaf blower in a garage is by hanging it on hooks secured to the wall. Get hooks that are easy to install and require zero handiwork experience. This method of storage prevents the hose from breaking or wearing down. It also prevents you from accidentally tripping or stepping on your tool. Make sure you place the hook at a certain height that can be easily seen and away from children. 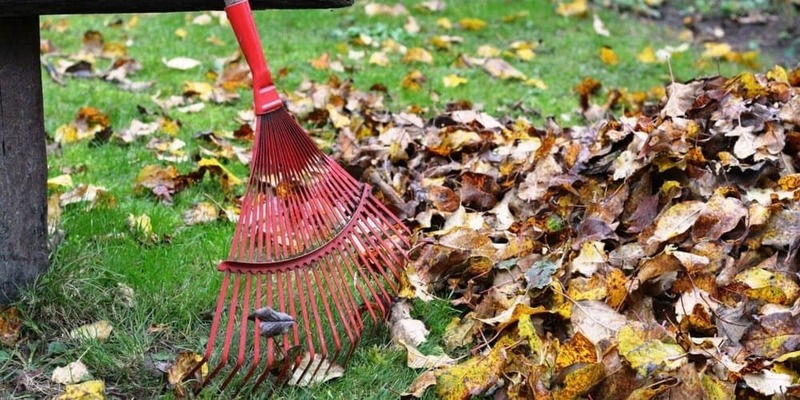 Plan ahead: Before you start a cleaning job, know where you want to pile up the leaves. You can place a large tarpaulin in the chosen spot so it will be easier to dispose of the leaves when you’re done with cleaning. Safety first: Make sure you put on safety goggles, hearing protection, and a dust mask before you start cleaning. Leaf blowers can be very noisy and hey also throw up a lot of dust and debris especially when the tool is set at high speeds. Using the tool: Point the tool downwards at a little angle above the ground as you slowly move across when you want to clean. One direction: Blow the leaves in one direction in order to know areas you’ve already cleared and areas you’re yet to clear. Finish up: It is not possible to clear every last bit of leaf on your yard with a leaf blower. So, finish up the cleaning with a lawn rake. Dispose properly: After piling up the leaves on the tarpaulin earlier set down, just fold it up very nicely and dispose it into your bin or compost heap. A: Use leaf blowers when you’re trying to sweep debris like fallen leaves, dried grass clippings, thin twigs, and dirt off your driveway, deck or sidewalk. They can also find additional usage when you need to blow off light snow off your walkway or chase cobwebs from your garage roof. A: There are many things that could prevent a leaf blower from starting, however, the most frequent cases are usually caused by damaged spark plugs or clogged carburetor. You can test if your spark plug is bad by using a spark plug tester. If you see a spark between the tester’s terminals when the engine is cranking, then the spark plug is in good conditions but if there is no spark, it means the spark plug is damaged and should be replaced. The other major cause is a clogged carburetor, this is more associated with gas-powered leaf blowers. Fuel overtime evaporates leaving some sticky substance which can clog up the carburetor and consequently preventing the engine from starting. In this case, try cleaning it with carburetor cleaner. You might need to replace the entire carburetor if this process is ineffective. Other things that could prevent a leaf blower from starting range from broken rewind spring, defective recoil starter or ignition coil. If you’re not sure of the problem, don’t try to fix it yourself because you might damage other things in doing so. Simply take it to the nearest service center for proper tool diagnosis and repair. A: Yes, you can use it to dry your car after rinsing or if it’s covered in light dust or pollen. A: Yes, you can use it clear up little snow build-up in front of your garage or on your car. A: Although some people use leaf blowers to force debris out of their gutters, it is not advisable because the force of the air will also push leaf and tree debris under the bottom tiles and into your eave space. You can clean up your gutter with basic tools such as brooms and garden rakes. A: CFM means Cubic Feet per Minute. It describes the volumetric flow of air that comes out of a blower. For example, if you have a leaf blower with a CFM rating of 350, it means 350-cubic feet of air is coming out of the blower’s tube per minute. A: MPH means Miles per hour, it describes the rate at which air escapes from the blower’s tube. The most important thing to look out for when shopping for the best battery powered blower is the power of the blower in terms of air speed and air volume. Powerful blowers have higher CFM and MPH. Another factor to consider is portability. A good blower should be lightweight and comfortable to carry. However, you should not go for the lightest ones, as they tend to have less power. Then, consider the battery. They are measured in voltages and ampere hours. Powerful batteries have higher voltages and amp hours, but they are also expensive. The good thing is that they have longer run-time than the weaker ones. Also, look at the duration of recharge of the batteries. Avoid the ones that take too long to charge, as they may cripple your job. ​Therefore, the highest rated cordless leaf blowers is the GreenWorks 24322 Cordless. It is powerful and easily cuts through heaps of leaves that its peers are unable to. It is also lightweight and can be used to clear leaves anywhere. If you are stretched financially, Black + Decker LSW221 is a good choice for hard surfaces and can even be used to dry your washed car. Its only weakness is that it is not very effective in the yard. The good thing is that it is very cheap. However, if money is not much of a concern to you, then you may also check out the DEWALT DCBL720P1 20V MAX 5.0Ah. It has one of the highest CFM, it is a powerful blower with a strong battery that has long run-time.